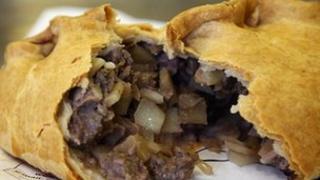 The government has defeated an attempt to overturn changes to VAT charged on takeaway food, dubbed "the pasty tax". A group of MPs had tried to exclude VAT from freshly baked products where no attempt was made to keep them hot. Attempts to exempt static caravans from VAT and to undo a cut in the top rate of income tax were among others to fail during debate on the Finance Bill. But Labour says it will vote against a freeze on age-related allowances - the so-called "granny tax" - later. The party said the freeze would cost some pensioners up to £323 a year. The "pasty tax" is one of a host of tax measures in last month's Budget that have caused controversy. The closest vote on Wednesday was over the imposition of VAT on static caravans. Seventeen Conservatives rebelled and the government's majority was cut by more than two-thirds to just 25. Ministers saw off opponents of the "pasty tax" by a margin of 35 votes. The government has faced protests over the Budget proposal - which it says is designed to end longstanding anomalies over VAT on hot food. Those calling for a rethink include bakers Greggs, Labour and some Conservative and Lib Dem MPs, who argue that tax increases will threaten jobs in the industry and increase prices for consumers by up to 20%. Hundreds of bakers have said they will march on Downing Street next week in protest over the tax changes. A group of MPs - representing constituencies in the South West of England - sought to amend the section of the Finance Bill relating to VAT on hot takeaway food. But Treasury minister David Gauke told the Commons that current tax rules on hot food were "complex and unfair" because, while a fish and chip shop would have to charge VAT on a sausage roll, a bakery next door would be tax-exempt for selling the same snack. He added: "The current rules mean customers simply do not know whether they are being charged VAT on hot food because it currently depends on the particular suppliers purpose for heating the hot food. "The new rules will ensure a level playing field and we are removing the subjective element." Most takeaway food served hot, such as fish and chips and curries, has been liable for VAT at 20% since the mid-1980s. Ministers have argued that zero-rated products such as pasties - which are put on display warm and subsequently cool down - should be brought into line and VAT of 20% should be paid on all products sold "above ambient temperature". The baking industry has argued that pasties, pies and other savouries are kept warm to improve their appearance or to comply with health and safety regulations and not for consumption and should therefore not be taxed. Asked about its stance on VAT on hot food, Downing Street said the Budget was "a fair Budget and the government sticks by it".